One of the best parts of my trip to Japan was the fact that I learned more than I taught. Yes, I traveled there as a child life professor to teach play techniques to hospital play specialists (HPS). But they had just as many wonderful techniques to share with me, and I cannot wait to incorporate them into my teaching repertoire here in the States. 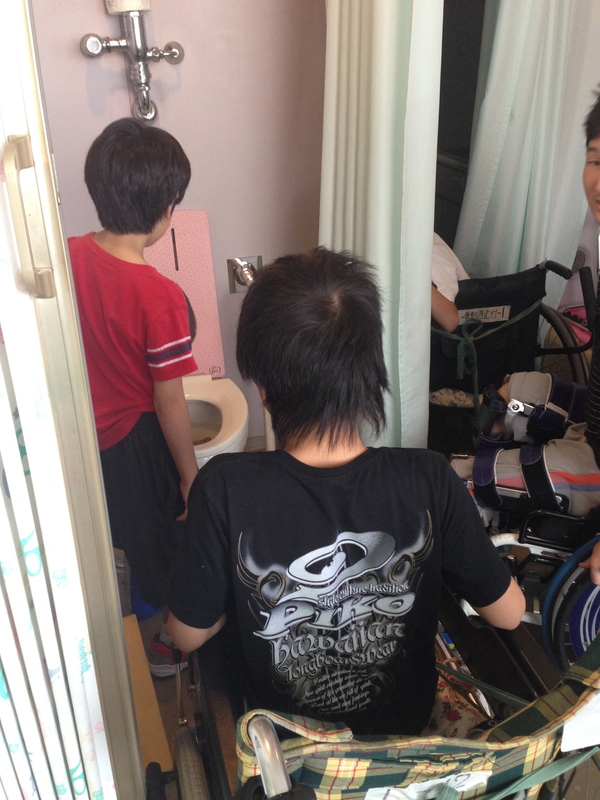 On our first day in Tokyo, Kazue Goto hosted Maria Busqueta and me at the National Rehabilitation Center for Children with Disabilities for a day of play with the inpatients on their orthopedic ward. She had prepared the children for our visit, and one by one, they approached us, shook our hands Western style, and introduced themselves by name. 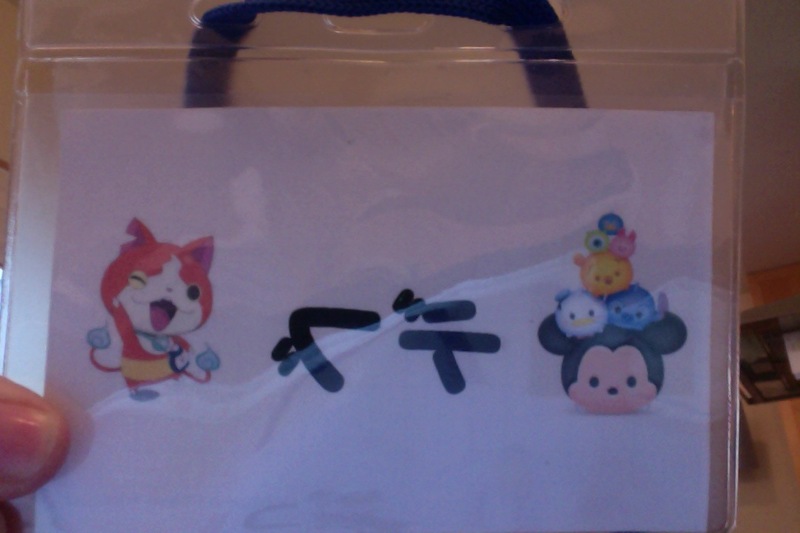 Kazue presented us with handmade name tags written in Japanese. I taught the kids how to play the American game “Spot It!”, and Maria taught them how to play Mexican Lotteria. We all made volcanoes together, and then the fun REALLY began. Kazue taught us all how to make poop. 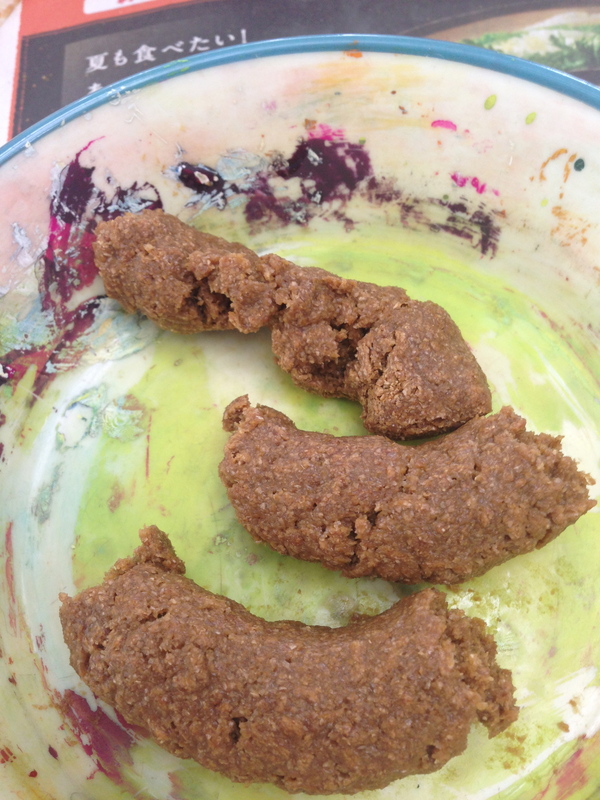 Yes, you heard it right — we all made poop out of bran cereal. The activity is designed to teach kids about their digestive systems. Many hospitalized children have issues with constipation or diarrhea, and this activity brings up helpful discussion about self care and gives children a chance to normalize something that can cause great pain and embarrassment. Four boys ranging from 10 to 14 in age joined us at a table. First Kazue demonstrated a digestive system made from loose parts. It included the esophagus, stomach and intestinal track in actual footage, and was made primarily out of umbrella bags. One boy jumped up from the table to grab the end and move as far away with it as he could. It measured over 25 feet! 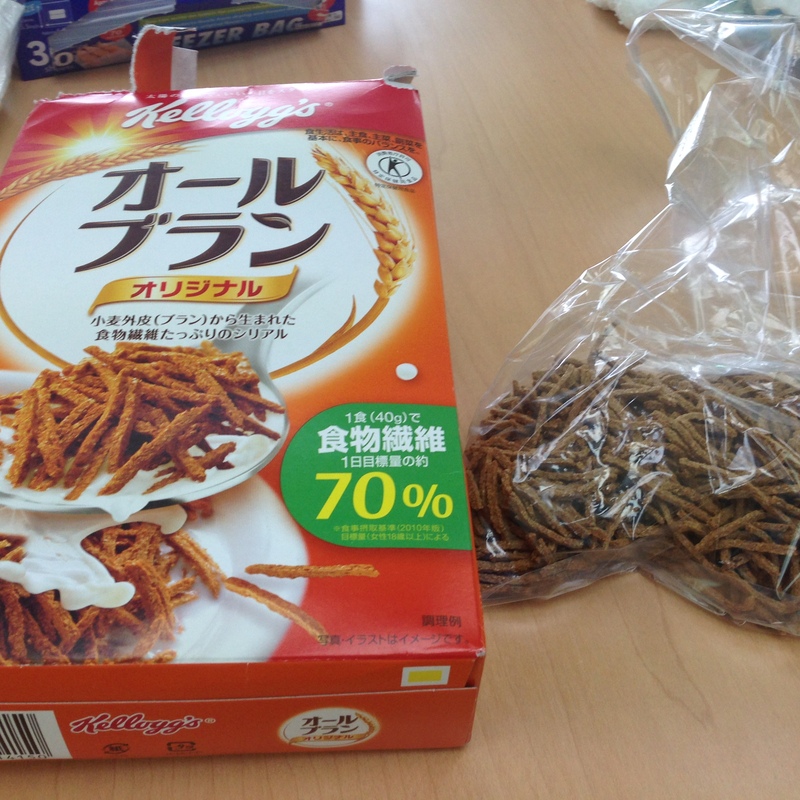 Then, Kazue gave us twiggy bran cereal and baggies, instructing us to pour the cereal into the baggy and break up the cereal into tiny pieces. 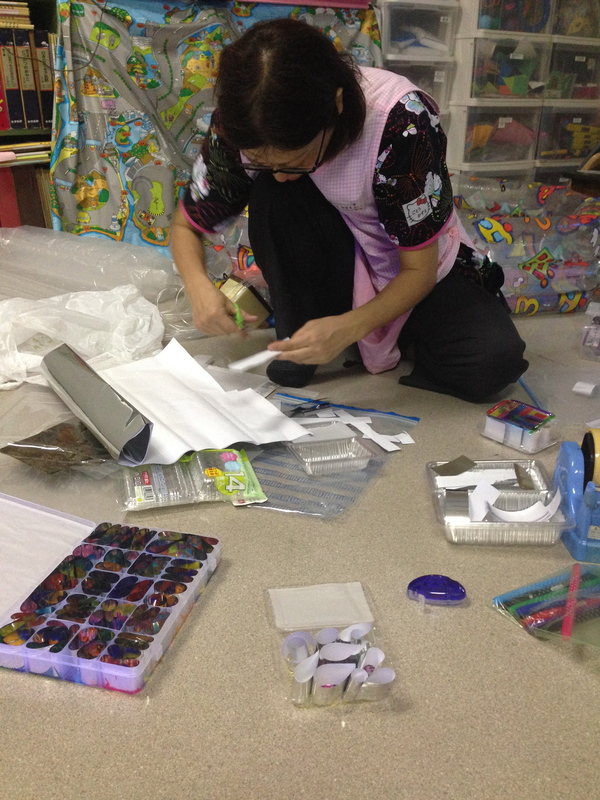 We banged and squished our baggies on the table, enjoying the therapeutic pounding for quite some time. Step two – transfer the smashed cereal into a ziplock bag and then add some warm water. “How much water?” I asked. “As much as you think you need,” answered Kazue. “Not enough and your poo will be too hard and it will hurt coming out. Too much and you will get diarrhea.” Discussion about hydration, good foods, and exercise for a healthy digestive track ensued. 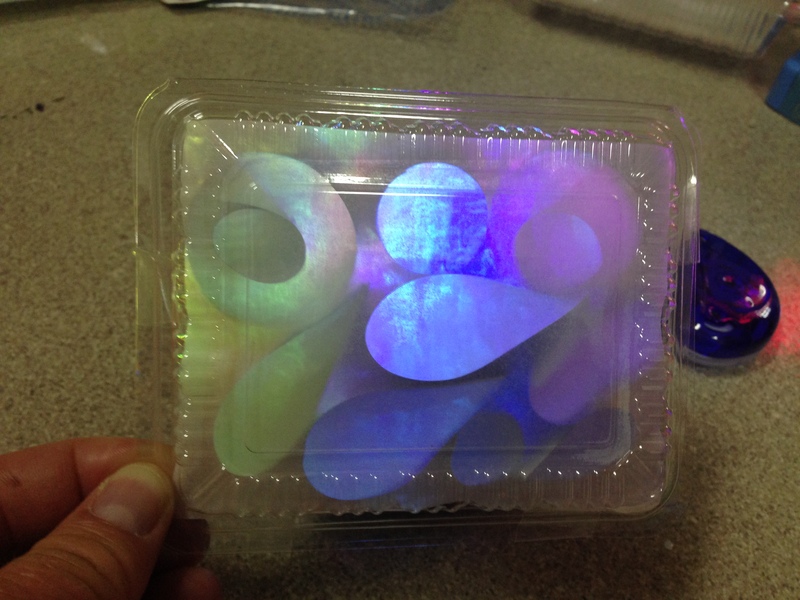 Step three — Cut a corner off the bottom of your zip lock bag and squeeze your poo out onto a plate or tray. We used paint dishes. Now how realistic is that?! And then, step four, it’s off to the bathroom to flush all of our poo. Needless to say, there was much laughter and hooting over this part. I said “Sayonara” to my poo as I flushed it down. After our poo party, Kazue brought us to her amazing sensory room and taught us how to make some pretty neat distraction light boxes. 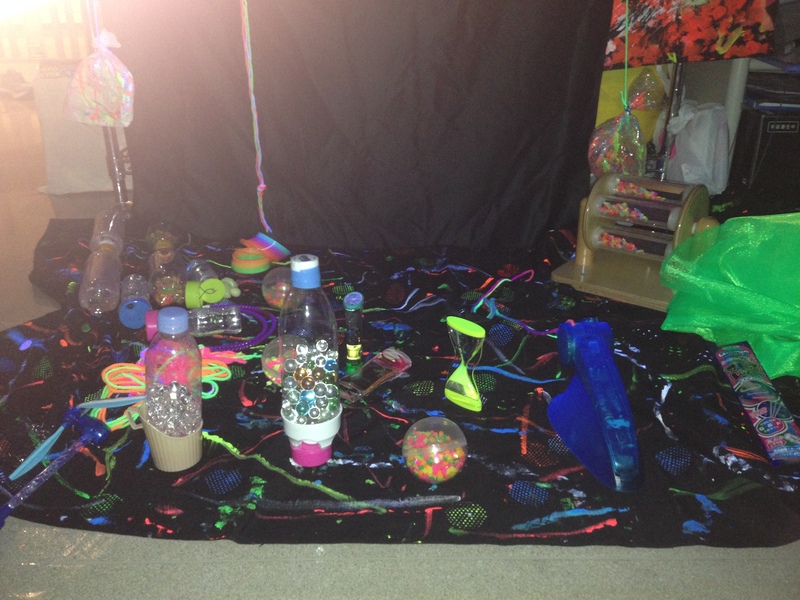 She has a Snoozelin, a black light, an iPad projector that can display fireworks on the ceiling from an app, and a ton of other amazing sensory items, many homemade from loose parts. We ended up spending an hour in the room with the inpatients with the lights off, and it was one of my most therapeutic moments while in Japan. Click here to watch a few seconds of the fireworks. 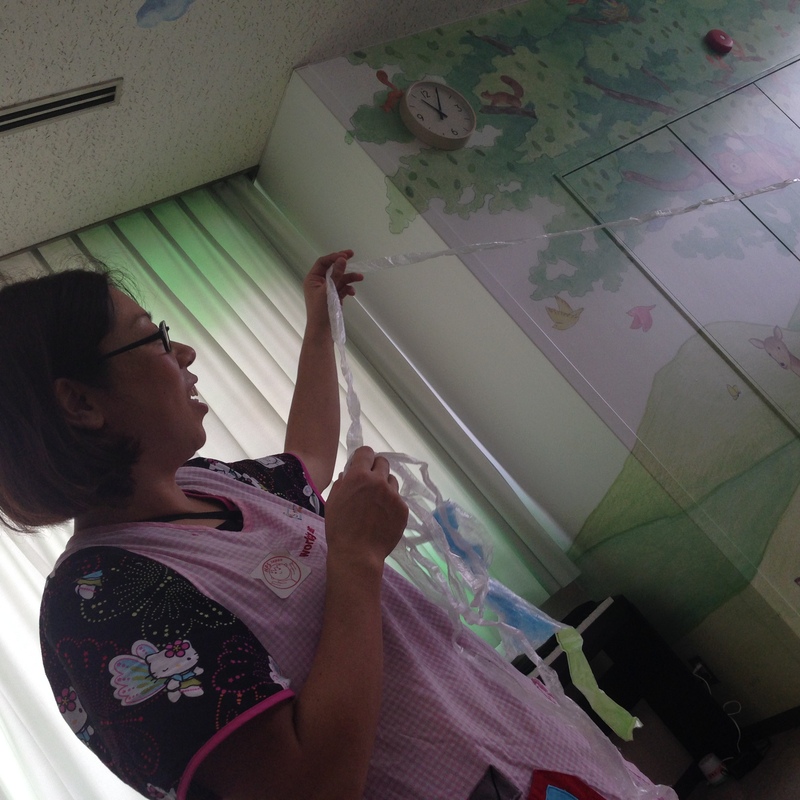 Our day with Kazue and the children was nurturing, fun, playful, and informative. What a fabulous welcome to Japan! Gross (yes, very realistic), fun and cool, all at once! If I did this with my kids, they would think I was the best mom EVER.